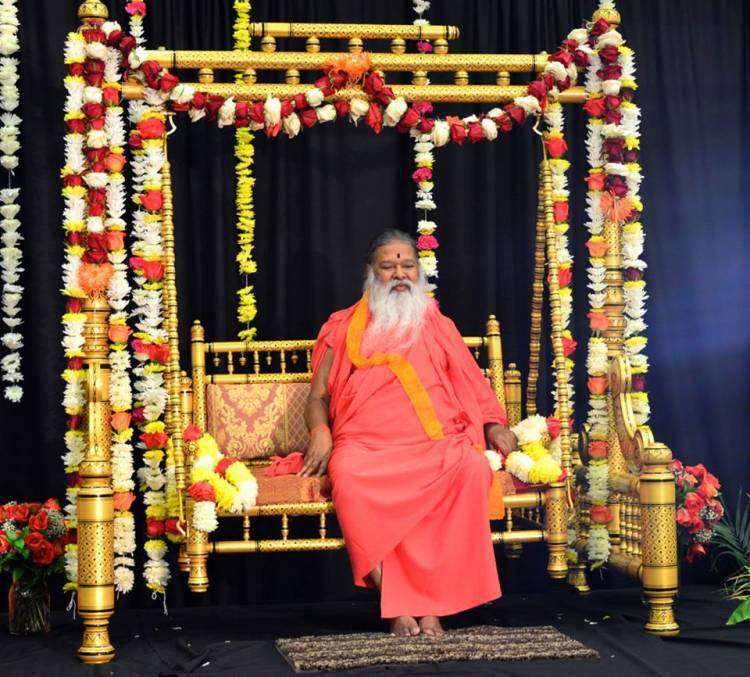 On behalf of Karya Siddhi Hanuman Temple, Datta Yoga Center and all the devotees across the globe, it is my pleasure to invite Sri Ganapathy Sachchidananda Swamiji to this majestic and magnificent Hanuman Temple. Let us invite Him by jointing our hands to create a thunderous applause. Sri Swamiji has been trekking the world imparting the divine knowledge to all his disciples to remove the darkness, to overcome the hurdles, to instill dharmic values, to create confidence, to generate enough strength to face the devil, to teach the value of meditation, to conquest the mind, to practice mouna (silence) and to cross the samsara. Sri Swamiji as a Sadguru par excellence guiding all his disciples to follow the spiritual path to overcome modern day trials, tribulations and turmoil that beset our mind, body and soul. 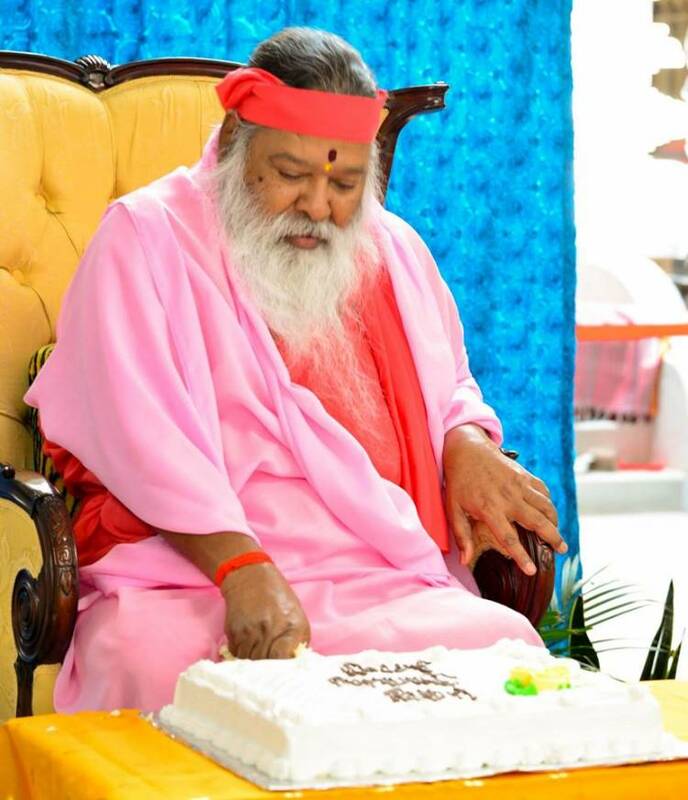 Over the years He has been championing the importance of meditation, training thousands of teachers to conduct Kriya yoga classes, and also helping millions of people to find peace of mind through Nado Pasana by conducting hundreds of healing and meditation concerts across the globe to tame the mind to experience the peace of mind. Off late, He is conducting mouna lessons to pull the wandering mind to experience the power of silence to preserve and produce the needed energy among participants. But control of the mind is better and more difficult. "Manojaya eva mahajayah-Conquest of mind is the greatest victory." In Bhagavad Gita, Arjuna becomes despondent and says, “O Krishna, the mind is very restless, turbulent, strong and obstinate. It appears to me that the mind is more difficult to control than the wind.” Lord Krishna said,“O mighty-armed son of Kunti, it is undoubtedly very difficult to curb the restless mind, but it is possible by constant practice and by detachment.” It is through practice abhyasa (practice) and vairagya (detachment) it can be achieved. 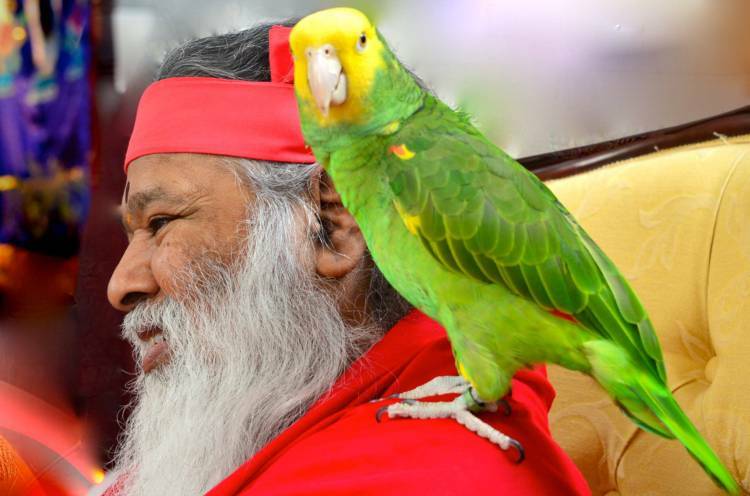 Sri Swamiji says that meditation is the means for a man to develop his higher faculties. Some of the common objects of meditation include a landscape, a great idea, image, name. the sun, the lamp flame, effulgence in the heart and panchabhutas. But concentrating on the presence of divinity in heart is the best object of meditation. Deep meditation leads to intuition. As Schopenhauer observed that Indian thinker’s interpretation of the world is internal and intuitive. For intuition unites everything while intellect divides everything. In fact, Steve Jobs attributed his success to intuition which he learned from India. A devotee asked Ramana Maharishi: "Why do we need to meditate? I say it is "my mind" - then should it not listen to me and meditate by itself when I tell it to? “Why does it keep running outside all the time?" Ramana Maharishi kept silent at that time. At about the same time, a squirrel had given birth in the ashram, and unfortunately a few days later the mother squirrel got eaten by a cat. Ramana Maharishi took the job of taking care of the baby squirrels. He kept them inside a cage that was kept in the mediation hall. After a few days when everyone was sitting in the meditation hall, the same cat came inside. It so happened that the baby squirrels rushed out of the cage at the same time. Ramana Maharishi got up hurriedly, caught all the baby squirrels one by one and put them back in the cage and locked the door firmly shut. He then turned to the devotee that had asked the above question and calmly said - "These poor little squirrels do not have the maturity to know the dangers of the outside world, that if it goes out, the cat will make a meal of them. When they get that maturity, they will go hide inside by themselves. Until they get the maturity, we have to keep putting them inside. It is the same thing with our mind. Our mind does not know that if it goes to the outside world, there is nothing but suffering. It keeps running out in ignorance. When it gets the maturity, it will go inside by itself. Until then, it is our job to put it inside with effort -which we do in meditation." In the last few years he turned his attention to the importance of mouna. As many us know that Sri Swamiji conducted Mouna session in Switzerland last month for three days – two hours in the morning and two hours in the evening for all three days. He suggested to them to maintain silence and asked them to let the thoughts flow and do not force yourself to control them. Mind needs practice. Why do we need to practice mouna and control the mind? It is a slow process. Observance of Mouna (vow of silence) for a couple of hours daily will help check the impulses of speech and thinking, will conserve energy, maintain balance, help meditation and controls the thought process. It is the first step to distance yourself from the external world and royal path to God realization. Sri Swamiji says that that mouna means not just tie your tongue but also pull your mind from gyrating. In fact, Sri Swamiji says, “Silence is meditation. Practice of silence is imperative. Silence pacifies man’s nature… Observing strict silence at appointed time is holy act. Silence does not mean merely holding tongue. Mind also should be given complete rest. It imbibes greater power. It becomes clear. It gets refreshed. That is why all great men and the sages practice silence. In Bhagavad Gita, Lord Krishna says, “Among things profound I am silence.”” That means silence is stillness, absence of fluctuations, chitta Shuddi (purification of mind). Sri Swamiji also mentioned that mouna develops will power, accumulates energy, controls the vagaries of mind, checks the impulse of the speech, controls anger, reduces ego, reduces quarrels, reduces irritability, minimizes jealousy, improves clarity, and purifies thought process. According to Patanjali’s Yoga Sutra, the classical text on yoga, the purpose of yoga is to lead to a silence of the mind (1.2). This silence is the prerequisite for the mind to be able to accurately reflect objective reality without its own subjective distortions. Yoga does not create this reality, which is above the mind, but only prepares the mind to apprehend it, by assisting in the transformation of the mind – from an ordinary mind full of noise, like a whole army of frenzied and drunken monkeys – to a still mind. But who is Swamiji? He is Akhanda, (indivisible), Amulya (dynamic, worthy of praise), Achintya (inconceivable), Achala (ultimate of the ultimate), Apoorva (exquisite / rare), Ananda (Bliss), Aprameya (Immeasurable, unfathomable), Aparoopa (extremely handsome) Akroora (gentle), Abhaya (protection), Abhyankara (giver of fearlessness), Adhiyajna (super soul), Aditya (sun), Anantajit (ever victorious) and Advaita, non-dual. 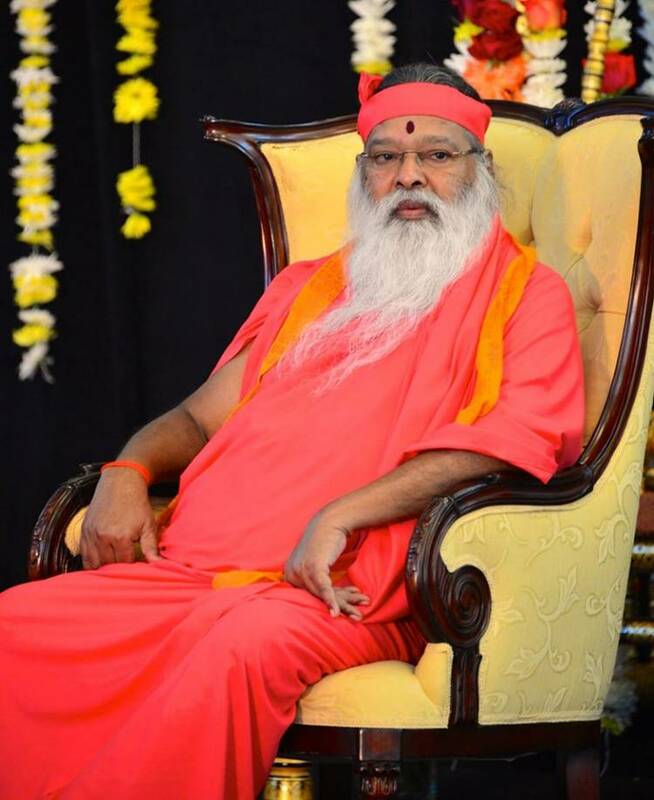 Sri Swamiji is the only guru that can guide you, direct you, mold you and make you take the plunge into various activities; he appears and is manifested only at the moment when you do plunge. A devotee should be ever ready for this kind of plunge with the confidence Sri Swamiji is there for you. Without learning it from another, how could anyone know That? But, Lord Krishna does not answer Arjuna's request until Chapter 18, Shlokas (verses) 65-66 where He says, "Let your mind be constantly directed towards me; be devoted to me; dedicate all your actions to me; prostrate yourself before me; over and above the claims of all Dharmas (duties) is complete surrender to me and me alone". That means a true devotee must keep thinking about Sri Swamiji constantly. He does not question the guru, does not interpret his words, does not doubt his messages, does not take it lightly; he simply follows the words of a Sadguru. Guru is an embodiment of love, compassion, guidance and morality. He has gone through the forest and know the dangers and pitfalls that lie ahead of us. If we us our intelligence, we will be trapped in these whirlwind of samsara. A devotee should know the divine nature of a Guru whose nature is difficult to follow. He is difficult to understand and his ways are unfathomable. A devotee would not to assess him, question him, compare him, measure him, judge him and always treat him as and treat him as an embodiment of Divine. No yardsticks can measure him. His magnetic aura is beyond the grasp of any devotee. Let us remember the Hanuman who represents the ideal selfless devotee. In spite of all his knowledge, wisdom, strength, perseverance, he never showed ego and served Rama faithfully by self-surrender. He never doubted nor questioned his Lord, Rama. He simply followed him to the letter. Despite rendering all kinds of services to Lord Rama, when the Lord offered him liberation as a reward, Hanuman did not accept it—he did not want anything in return other than more service. Once Sri Shankaracharyawas traveling with Padmapada and set up a camp on the banks of Kaveri river. Padmapada was collecting few things the other side of the river. Shankara wanted to test the devotion of his disciple Padmapada. The river Kaveri was in flood. Sri Shankara was standing on one bank of the river and Padmapada was standing on the other bank. Sri Shankara asked Padmapada to come to him immediately. Even without thinking of the floods and how he might even down Padmapada, he at once started walking on the water. Surprisingly a lotus appeared on every step he had taken to hold him so that he would not drown. This is real devotion. Through the grace of Shankaracharya, Padmapada walked quite easily on the river. 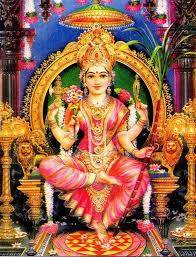 The disciple got the name Padmapada, which means ‘lotus feet’. It is such a 'Bhakta' that is dear to Sri Krishna. And most important of all, those Bhaktas are most dear to God who love him with full faith in his supremacy. Shampoo my waist with your feet! Once a saint, in order to test his disciple, ordered him to shampoo his waist by his feet. The saint said, “My waist is paining. Will you, my dear disciple, shampoo it with your feet?” The disciple said, “Maharaj! How am I to put my feet on your holy person? That is a great sin.” The saint replied, “But are you not, in thus disobeying me, putting your feet on my tongue?”One should learn a lesson from this example. The disciple should not exercise his intellect in carrying out the orders of his guru. He should discard impertinence and develop true and lasting devotion. One should serve a saint in every way, serve him physically, meditate on him, carry out his orders without delay, try to serve his mission, and so forth. One should have unflinching faith. Mysterious are the ways of a saint. The services that he takes from you are for your own benefit. He himself wants nothing. By giving various orders and testing you in various ways, he makes you a fit vessel for the reception of enlightenment. To become an ideal devotee of Sri Swamiji, total dedication to Sadguru Sri Swamiji is imperative to develop bhakti. A devotee develops with realization that Sri Swamiji is a self-realized Master, ever compassionate, never hateful, ever loving, never hurting, ever helpful never detestable. We all should realize that Sri Swamiji is none other than God himself who is ever watchful guiding, teaching, molding and reshaping our mind, body and soul. Complete surrender, unflinching faith, unquestionable trust and unwavering obedience yields Sri Swamiji’s grace, compassion and love bringing the disciple close to his Sadguru. Let us cultivate that bhakti by listening Sri Swamiji’s discourses, listening and singing bhajans, chanting of japa, conducting pujas obeying his commands, engaging in selfless service, and involving in various spiritual practices. Do whatever is necessary to gain that bhakti, and if you can irrigate the garden of your heart with the waters of bhakti, then there will be no real effort required to dispel the doubts. You will be simply transformed by your sincere devotion and communion with God that all the worldly desires, attachments, Vasanas, and Samskaras will just fall right away. Intense devotion to one’s guru and faithful adherence to his teachings is the most essential qualifications of true discipleship. It is this shraddha, faith, and guru bhakti, devotion to guru, that bring about rapid spiritual progress and fruition of one’s sadhana.Swami Sivananda says, “A disciple without devotion to his guru is like a flower without fragrance, a well without water, a cow without milk or a body without life. A true aspirant rejoices in the practice of guru bhakti yoga. Without taking recourse to this yoga one cannot practice the other yogas... It is the magic wand in the hands of the disciple to cross the ocean of samsara. Guru bhakti, that is undaunted, unwavering and selfless service, is essential to reap the benefits of Guru’s love and kataksham. The love Sri Swamiji shows toward all his devotees is proportional. No pretense nor lip service would yield the results. The fundamental requisite for a true bhakta is to understand that a whole-hearted love for Sri Swamiji is indispensable. This kind of love outshines All other streams of love ultimately join this great river of love for the Master and disappear in it. Sri Swamiji’s divine love, blessings and compassion slowly burn all of our problems, peel off our weaknesses and build up trust. Here is an example of one of the devotees of Swami Samarth Ramdas, who showed his true bhakti even with the realization that he might die. One day, Swami Samarth Ramdas asked all his disciples to come to him and pretended that he might die because of sickness. He wrapped a mango around the joint of his knee to appear that there was ahuge swelling. He pointed to his swelling and told his disciples that it was a malignant tumor and that there was no chance of his living unless someone sucked out the poison from the joint. He also made it clear to all that whoever sucked out the poison would die instantaneously. All hesitated except Kalyan, who began to do his guru's bidding. To his surprise Kalyan found sweet mango juice and not poison and Swami Ramdas praised his unswerving faith and self-denying love. To be willing to die for the happiness of the Beloved is true love. He had placed a mango on the joint of his knee and bound it in a bandage so that it looked like a huge swelling. He pointed to his swelling and told his disciples that it was a malignant tumour and that there was no chance of his living unless someone sucked out the poison from the joint. At the same time, he made it clear to all that whoever sucked out the poison would die instan-taneously. All hesitated except Kalyan, who began to do his guru's bidding. To his surprise Kalyan found sweet mango juice and not poison and Swami Ramdas praised his unswerving faith and self-denying love. To be willing to die for the happiness of the Beloved is true love. Such implicit faith, unfaltering love and undivided loyalty as that of Kalyan can come to the disciple only through the grace of the Master. Grace cannot be bought. It is gained by being always ready to serve and reluctant to be served. To serve the Master is to serve one's own Self in every other self. Let us look at what Adi Shankara about the worship of a Guru by an earnest devotee. What should he be thinking, saying, doing, observing and practicing. The Verse 27 in Soundarya Lahari summarizes the devotee’s responsibility to his Guru, Sri Swamiji. Not only we need to talk about the power and greatness of our Swamiji, but we all have the responsibility to discipline our body, mind and soul; and concentrate our mind on our Master Sri Swamiji. Kabir’s description of a good disciple is more appropriate to illustrate a point. The best way to welcome Sri Swamiji is to practice what is illustrated here. He forgets not his Master for a single moment. That is the sign of a good disciple, says Kabir. So must a good disciple think at all times of his Master, says Kabir. And brushes aside all other work in order to obey Him. He holds his Master as the only true authority, declares Kabir. However it is contrary and unpalatable. And this is ever true and at all times. In a moment He showers His blessed radiant grace. And faithfully the dog will follow wherever the Master leads him. If the Master calls him, he runs to Him gladly with all his swiftest speed. Whatever lot is meted out to him. He asks for nothing but for Him. But no harm can ever come to the Master's servant. Where then, I ask you is the servant? As the adage goes, one who can control his mind, can conquer the world. To achieve that goal, let us become true devotees of Sri Swamiji, develop guru bhakti toward Swamiji, control the mind through practicing meditation and mouna, conduct our self with utmost faith and respect, keep thinking about Sri Swamiji, avoid vanity and disdain, and be a humble servant like Hanuman serving Sri Swamiji. Let us be ever ready, ever thinking, ever obeying and ever serving. Let us put our hands together in inviting Sri Swamiji to Karya Siddhi Hanuman Temple. Jai Guru Datta, Jai Guru Hanuman.